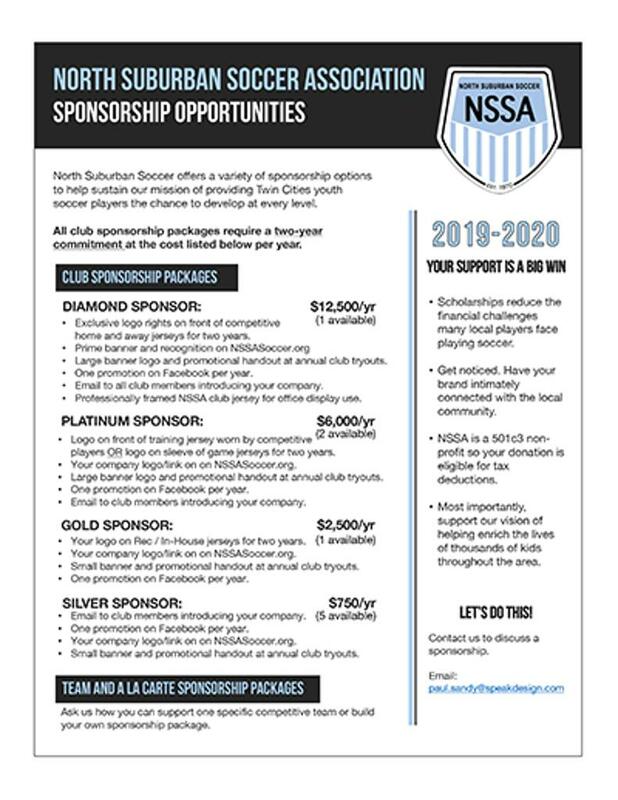 North Suburban Soccer is currently seeking sponsors for our 2019-2020 seasons. NSSA is a 501c3 nonprofit organization that operates youth soccer programs for nearly 1,100 players ages 3-18 years old. Your investment in our community-based soccer program will help sustain our mission of providing Twin Cities youth the opportunity to develop at every age and skill level. Sponsor donations will be allocated to activities that are critical to club operations, including: player development, coach education, field rental, equipment purchasing, player scholarships and field maintenance. Download our available sponsorship opportunities or contact Paul Sandy to discuss how you can “build your own” sponsor package.